Novatek is ready to reduce stake in the LNG project, but says no decision yet on Indian firms. Over the past few weeks, media reports stated that a consortium consisting of three Indian companies (ONGC Videsh, the Indian Oil Corporation and Petronet LNG) were looking to secure a 9 percent share in the Yamal-LNG project and were also prepared to purchase 5 million tonnes of liquefied natural gas. Analysts think that the Indian proposal will help Russians to take a more beneficial stance in talks with the Chinese. OAO Novatek, the largest independent and the second-largest natural gas producer in Russia, is not yet ready to confirm India’s participation in the project. 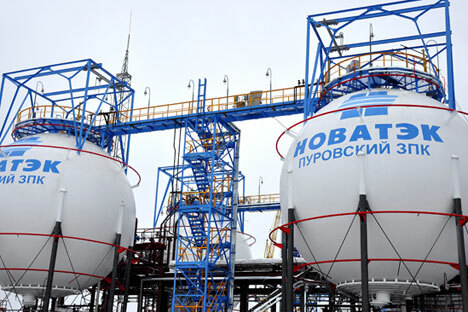 The company’s press service confirmed to RIR that Novatek is willing to reduce its stake in the Yamal LNG up to 51 percent, but refused to comment on with whom it’s currently negotiating with. The Yamal-LNG project is being developed by the Russian company Novatek and the French company Total (with a 20 percent share). This project proposes extraction of natural gas from the Yuzhno-Tambeysk natural gas field, with reserves estimated at 907 billion cubic metres and the construction of a gas liquefaction plant over three phases with a total output of 16.5 million tonnes of liquefied natural gas per annum. A seaport will be constructed and an ice-breaking tanker fleet will also be created as part of the project. Investment is estimated at $20 billion, without taking into account investment in transport infrastructure. At the end of October ‘Yamal-LNG’ and the Chinese state-owned company CNPC signed framework conditions for an agreement to supply liquefied natural gas. This stipulated the sale of not less than 3,000,000 tonnes of fuel a year on DES terms (Delivered Ex-Ship) over the course of 15 years, with an option to extend. CNPC is also about to become a 20 percent shareholder in the project. At the beginning of September Novatek and CNPC signed a buy and sell agreement and the deal is due to be concluded by December 1 on receipt of all necessary regulatory approval. As a result Novatek will retain a 60 percent share in the project, CNPC will hold a 20 percent share and the French company Total will hold a further 20 percent share. Rusenergy partner Mikhail Krutikhin in turn suspects that talks with potential Indian partners could be used to smooth things over for the Chinese in terms of joining the project and also with respect to the purchase price for gas. “It’s not a very powerful lever, but it does work,” he told RIR. Krutikhin agreed with his colleague that Chinese companies are more active in Russia. This is partly because they possess almost unlimited financial resources and they work flexibly and aggressively at the same time. However, the expert is certain that Indian companies do have the potential to outflank the Chinese, in reaching the Arctic for example. “An Indian state company could acquire control over an asset, with rights to a plot of land in Spitsbergen. We are aware that the Chinese are holding talks about this but there is still a chance that they could be forestalled. This would give an Indian company the right to formally secure membership of the Arctic council and other political benefits for their country – and I emphasise this, they would be ahead of the Chinese,” Krutikhin noted. At the beginning of November ‘Yamal-LNG’ found its first important client for its raw materials in Europe in the shape of the Spanish company Gas Natural Fenosa. Deliveries will commence in 2017 and Spain will receive 3.2 billion cubic metres of gas. This represents around 10 percent of annual consumption in Spain. Over the course of the contract GNF will purchase 80 billion cubic metres of Yamal gas. The conclusion of the Spanish contract is far from incidental. “You can only obtain credit for construction if you have firm agreements with consumers. Rosneft and Exxonmobil have already secured these for their LNG project on Sakahlin. Gazprom though were not able to secure this for their project in Vladivostok,” Krutikhin noted. Anatoliy Voronin, an analyst at the International Holding Company FIBO Group is in agreement with Krutikhin. “A contract shows that the project is alive, and whether the Europeans believe in the project,” he told RIR. It is true that in contrast to Krutikhin, who is certain that the project is oriented first and foremost towards the Atlantic region, Voronin suggests that the principal client for Yamal-LNG would in any case be China. Supplies of LNG to India and China in 2012 were more or less level and amounted to around 20 million tonnes per annum. Gas production in India has reduced over the last two years by 20 percent - to 40.2 billion cubic metres in 2012. Consumption has also been squeezed. Demand for energy resources, which saw a partial rise by 5 percent in 2012, were capped by anticipated growth in the demand for coal. This however creates problems for consumers, who have already become accustomed to using a blue fuel. The sales geography for China though is very widespread. Liquefied natural gas travels to China from more than a dozen countries. India is to a much greater extent tied into supplies from Qatar, from where it receives 4/5 of all its LNG supplies. This creates additional vulnerability. Podlevskikh is certain that a possible alliance with Yamal LNG would lend India as a consumer greater stability and the potential to increase its energy consumption.